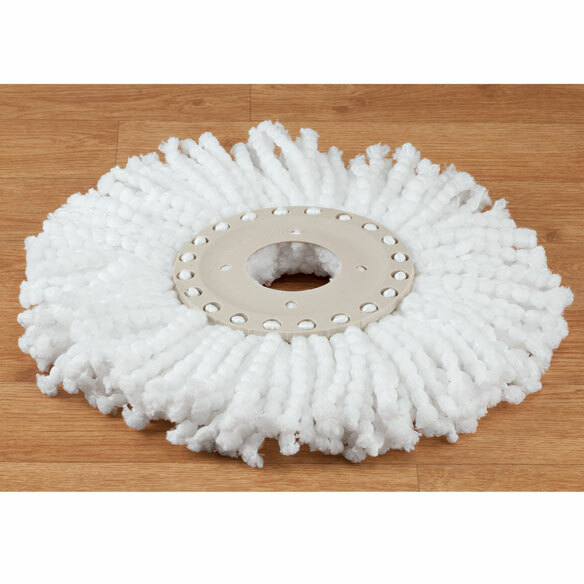 Clean spin 360° microfiber replacement mop head lets you keep your floors in sparkling condition. This replacement 360° swivel head attaches right to your clean spin 360 mop system for unparalleled cleaning. Microfiber mop head is machine washable. We use this item for kitchen and bathroom floors. I use this mop head to scrub floors and walls also baseboards. The spinning feature is my favorite, makes cleaning faster. using this tub and mop together means my hands never have to touch the mop or wring it out. Wonderful system. It was so wonderful to know I could order the replacement head to my spin mop off you guys and I be ordering again soon. I try to keep supplies for my job. And I will be telling other people how great it works. Mop head fibers fall apart in wash, does not last. will spend more on replacement heads. I truly thought I was saving and bought (2), did not need them right, when I did...too large for my mop. I called & the representative asked me to try it, but it was a no go. It would help if the diameter of the replacement was given so others would not make the same mistake. This did not fit my mop handle, but I did not waste the money to send it back. I purchase this item before. I have the Clean Spin 360 and anticipate needing a new head sometime in the future-this is the first place I've seen one. It make moping easier because I do not have to touch the mop. Spin mop is the best mop I have ever used. It has cut my chore considerably and I love it! Finally found which mop I have-very difficult. This mop is the best, do not dirty or wet your hands, no bending " In love with the usage of this product. I chose this replacement mop because I needed a new one. I have a 360 spin mop and it is excellent. Great Price! Love this mopping system. My hurricane mop only came with one.